Rocky Springs Was Made To Treasure! 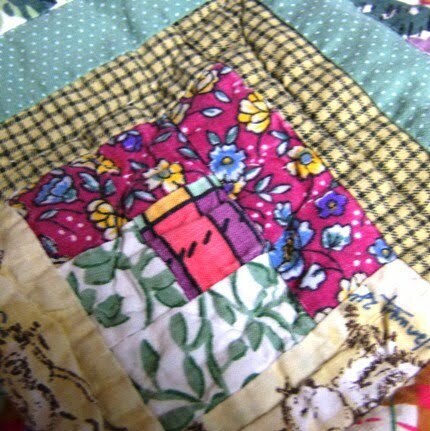 While scouting a thrift store in Thibodaux, Louisiana, I uncovered a good quality, hand sewn, machine sewn block quilt with spring florals, polka dots and plaids. I fell in love with this quilt from the moment I laid eyes on it because the sweet Cajun woman who made the quilt stamped her name on the back of all four corners. Irma Daigle was very proud of this quilt when she finished the soft, cozy and very comfortable quilt. The following came from the City of Thibodaux website where Irma was Senior Mayor of the Day in 2006. "Mrs. Irma Daigle was born and raised in the City of Thibodaux. She was married to Mr. Raymond "KeKe" Daigle for 52 years. Irma was a Beautician and is a wonderful Seamstress." Irma Dantin Daigle, 79, a native and resident of Thibodaux, died at 6 a.m. Thursday, Oct. 7, 2010. The colors are old fashioned green, pink, brown and cream and believed to be very old. One piece of the fabric has January and August 1903 printed on the piece of fabric. If I could guess an age the fabric looks 1930. The quilt fabric and backing are both cotton and the quilted side is cream color cotton as well. There are two tears, one on the cream border and one on a square which measures 1/2"-1" at most. There is a seam that needs to be re-stitched by hand and a thread that is out of place. Quite charming if I say so myself. The quilt comes from a smoke-free home.